Holiday perfection of Orana Lakehouse. Long expansive beaches, relaxing waterfront accommodation and lazy days with nowhere in particular to be… sounds like a dream, huh? We’ll let you in on a little secret, it’s a real place! About two hours’ drive north of Sydney, past Gosford and just before Newcastle sits a little slice of heaven. 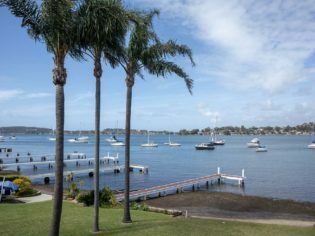 Lake Macquarie (Awaba) is Australia’s largest coastal saltwater lake. Between its natural beauty and the cute suburbs curled around its shore, this under-the-radar gem has exactly what you need for the perfect weekend away. The local artworks hanging at Doubletake Cafe are stunning. Featuring work from local artists on the walls, this delightfully charming, uncomplicated cafe packs a massive punch when it comes to food. The Doubletake ethos is ‘simply good food’ and it shows: these guys take local produce and mix it in with organic fruit and veggies from their own urban farm without applying the usual ‘artisan’ price tag. My recommendation? The haloumi poached eggs with an extra hash brown. As far as relaxed cafes go, it doesn’t get more chilled than the Wangi Deck Cafe. Overlooking the lake, this cafe has easily one of the best views (and coffee) in the area. Each dish here is a celebration of good food and is made with love. Enjoy a bottle at Crusoe’s on the lake. Picture it: the sun is beaming down, you’ve got a glass of rosé in one hand and the freshest seafood in front of you. Dream-worthy stuff right? Well Crusoe’s on the Lake has got the goods! Popular among many (not hard to see why) it undoubtedly has the best location on the lake which is only bettered by its delicious food. A dozen oysters anyone? The Vegan Bro burger in all its glory at Burger Bros.
OK, so let’s take things back to basics. Sometimes all you really need in your life is a good beer and a delicious burger and boy, are these burgers are out-of-control good. Enter: The Boat Shed Bar + Galley. These guys use real ingredients with a strong focus on quality food and drinks… speaking of which, they have 17 craft beers to choose from. Cheers! Staying longer than the weekend? The lush greenery of the Lake Macquarie City Art Gallery. This stunning art gallery is positioned in the perfect location: nestled right beside Lake Macquarie with plenty of trees on its grounds, it makes for the perfect way to spend an afternoon. Not only does the Lake Macquarie City Art Gallery host cutting-edge exhibitions, it also holds kids art classes and pays homage to the area’s Indigenous ancestors whose family lines remain today. The gallery is closed for renovations from the end of March 2019 due to the need for an expansion, but once open in September it’ll introduce a permanent contemporary Aboriginal art exhibition space, making it well worth the wait. Succession (detail) 2016 – cement, steel, steel slag, coal ash, oyster shell, organic matter. Pro tip: make sure you grab a coffee from Awaba House Restaurant & Café and spend some time wandering around the sculpture park on the grounds of the gallery; the piece Succession by Jamie North was featured in the 2016 Biennale of Sydney. LMCAG has left you wanting more? Pop these on your must do’s! Even on overcast days, the walk is gorgeous. This cute little shoreline makes for the perfect backdrop to working off that Doubletake cafe breakfast. On a sunny day enjoy an ice-cream from Greg and Audreys and watch the world go by. Live like an explorer at Caves Beach. Head down to Caves Beach at low tide and feel like an actual explorer. We counted no less than three wedding parties getting their happy snaps taken in the area and it is easy to see why. These sea caves are divided into two sections: the first is easily accessible and quite popular, the second is a little bit trickier to navigate with less tourist visitation. Either option you choose to explore, speak to Caves Beach SLSC for advice and remember to leave enough time before high tide returns. JetBuzz still allow you to have fun with out needing a boat licence. No boat licence? No worries! The handy guys at JetBuzz have got you covered with boats that only require a driver’s licence to take out for a spin. So the boats themselves aren’t exactly superboats but they are easily the most relaxing way to get around the bay. If a tinny isn’t your style, JetBuzz also has stand up paddleboards and kayaks ready to go. Be sure to say hello to the family of friendly pelicans who have made this place home! Shhh, this one’s a secret! Just down the road from Caves Beach sits the cutest little beach spot on the coast. Catherine Hill Bay nods to its historical mining past with period architecture and rusted machinery from times past. Popular among surfers, swimmers, fisherman and photographers, the beach itself has time and time again featured on the “101 best beaches in Australia” list. Worth the drive, wouldn’t you say? Its in the details at Orana Luxury Lakehouse. If you are looking for absolute waterfront bliss, that is exactly what Orana Lakehouse offers. Adults, picture this: you’ll chill upstairs on the deck with uninterrupted views of the lake with your feet up and wine flowing. The kids? They’ll be downstairs keeping themselves entertained with the pool table or out on the water with the kayaks. Gorgeous on the outside and inside, it’s the perfect combination of homey and nautical with every surface thoughtfully designed and considered for your holiday. There are a total of five generously sized bedrooms, allowing up to 11 people to sleep, but don’t worry about it feeling crowded – the house is so big you’ll barely know anyone else is there. One of the many spacious bedrooms. If you feel like holing up indoors for a day, the house is filled with hidey holes, nooks and crannies designed for your reading and writing pleasure. And if you’re a serious entertainer, the house features no fewer than two barbecue areas, a huge kitchen, a dining area that fits a small army, and a billiards and bar area to retire to after dinner. Itching to get outside? Pack a picnic and take the provided kayaks (life jackets included) on the water for the day. And from fully stocked fridges to extra bedding for guests, if you have any special requests prior to arrival Steve the host thrives on ensuring your holiday is as personalised as possible. Just your friendly neighbourhood pelican. Lake Macquarie provides the perfect ‘leave Friday, come back Sunday’ experience ensuring no one in the family will get bored. Food, beach, culture, chill, repeat… need I say more? Looks great, what is the address please, for Orana Lakehouse. I can never understand why Lake Macquarie isn’t a bigger weekend destination for City people. It is just over an hour from the beginning of the freeway. You can stay on the lake and if there isn’t enough beauty here you are less than an hour from the vineyards.